During his lifetime Cosimo focused his spending on building a large and handsome palace that became one of the showpieces of Renaissance Florence. Many objects that were once part of the palace’s interior decoration have been dispersed (see, for example, the Orsini-Medici vase discussed earlier) and are now held in the collections of museums around the world. One aspect of early Medici patronage was the creation of a princely identity for the family by connecting it to the lay confraternity of the Compagnia de’ Magi, a social group composed of well-to-do Florentines. Dedicated to social benefit and acts of charity, they associated themselves with the three kings who came from afar to honor the birth of the Christ Child. A stunning round painting, commissioned by either Cosimo de’ Medici or his son Piero, was on view in the Florentine palace, according to a 1492 palace inventory. From all evidence it was the most prized work in the Medici collection. Painted during the 1440s and late 1450s, begun by Fra Angelico and finished by Filippo Lippi, the tondo shows the newborn Christ Child being honored by the Three Magi. The Magi are depicted in a magnificent procession that was meant to bring to mind the processions of the Compagnia de’ Magi through the streets of Florence, an event held every five years under the auspices and with the financial support of the Medici. The richness and extravagance of the Magi entourage seems intended to echo the magnificence with which the Medici surrounded themselves. On the roof of the shed in the center of the painting are a peacock, an ancient symbol of immortality, and a type of hawk, the goshawk, shown with its prey, signifying superiority and victory over enemies. It has been argued that the two birds were added, in a final reiteration of the propaganda message, after the painting had been substantially completed. The blunt message is that the Medici family is destined for longevity and triumph. Throughout its long history the Medici family was adept at using symbols as a way of making reference to themselves. The peacock and goshawk in the Adoration of the Magi tondo stand as an important early example. 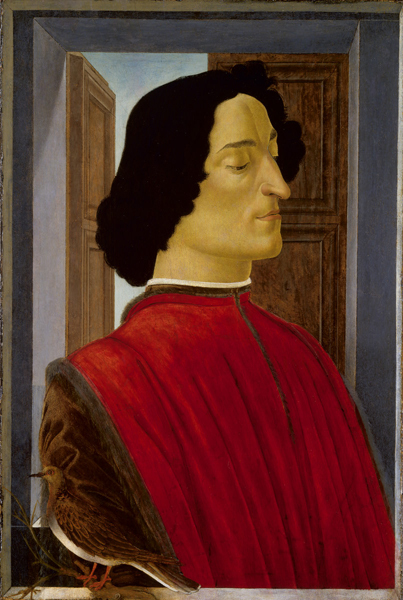 Piero de’ Medici, Cosimo’s son, employed a more antiquarian outlook in his patronage, in line with the emphasis on learning and the revival of antiquity that gained currency in Italy during the second half of the fifteenth century. He concentrated his collecting energies on acquiring a fine collection of ancient and modern coins, displayed in his studiolo in specially constructed cases. A medal honoring Cosimo was cast following his death, almost certainly under the sponsorship of Piero, which proclaimed Cosimo “Father of the Country,” following an antique formula first used for Cicero. It has been suggested that perhaps even Donatello may have had a hand in designing the medal. The inscription encircling the profile head of Cosimo on the front of the medal reads MAGNVS COSMVS MEDICES · P P P ·, the three letters P standing for Princeps Pater Patriae (the great Cosimo de’ Medici, prince, father of the country). On the reverse, a female personification of the city of Florence, identified as “Florentia,” is seated on a portable folding chair called a faldstool that is associated with rulers in antiquity. Florentia holds a laurel branch, symbol of peace, in one arm and extends the sphere of rule in the other. The inscription along the outer edge of the reverse reads PAX LIBERTAS / QVE PVBLICA (Peace and Public Liberty). The implication is that Cosimo, assiduously serving Florence, is himself a personification of the city. Florentia’s chair rests on a yoke, which was destined to become a standard Medici emblem that signified service and dedication. The future Pope Leo X, Piero’s grandson, would take up this emblem as a personal device. The medal is known in two versions. The later version adds a further layer of glorification by specifying in its inscription that Cosimo was given the title “Father of the Country” by public decree—COSMVS MEDICES DECRETO PVBLICO P P ·. The portrait in the second version is more idealized. Some of the marks of old age have been smoothed from the sitter’s face, and the head has been given a more rounded, sculptural form. The patronage of Lorenzo de’ Medici ranged far and wide and was evident on many fronts. 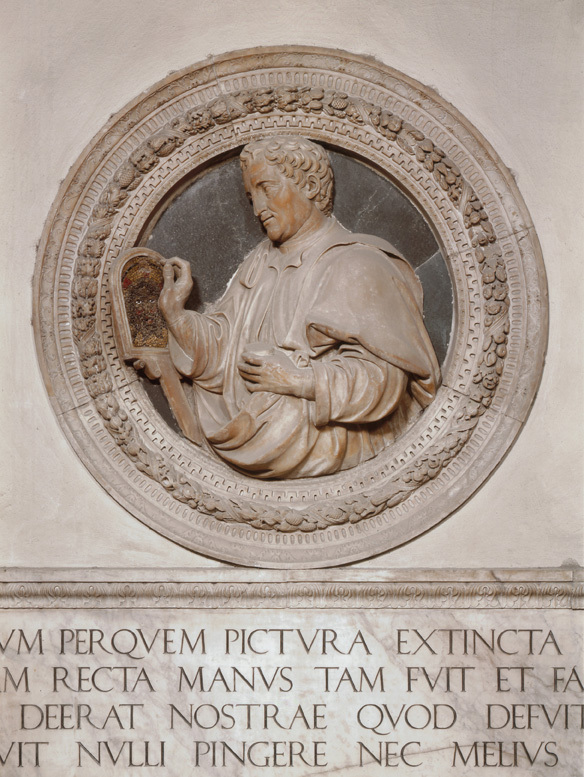 His promotion of Florence as a cultural capital resulted in the elevation of Dante Alighieri, Giovanni Boccaccio, and Petrarch to the status of poets emblematic of Florentine cultural achievement. Apparently with Lorenzo’s encouragement the humanist Cristoforo Landino prepared an edition of Dante’s Commedia, published in Florence in 1481, with an extensive commentary that linked Dante firmly to Florence. 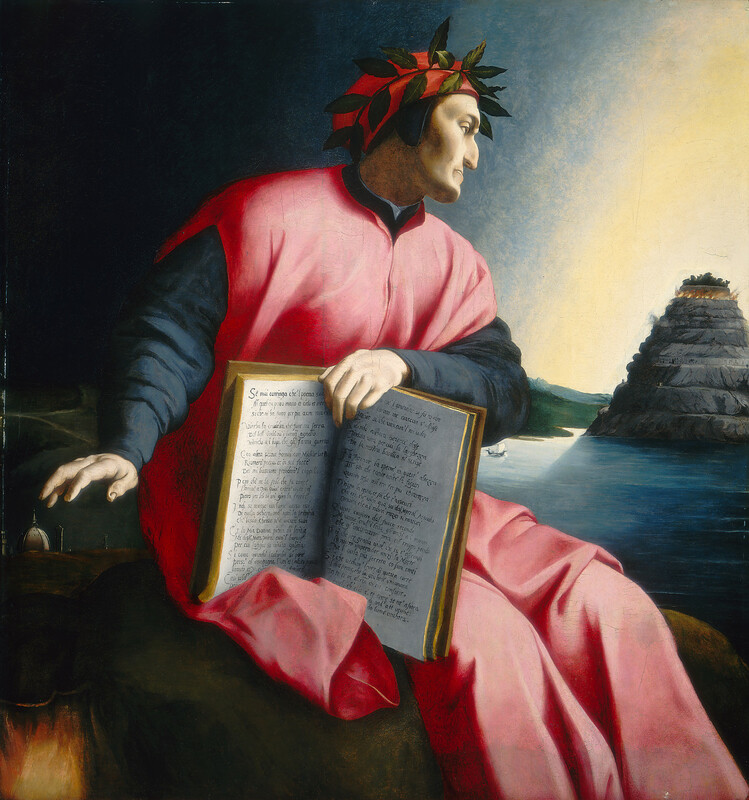 Landino’s publication would have a long life as the authoritative text of Dante’s poem. Portraiture gave the Medici visibility in the competitive Florentine political and social scene. A handsome portrait bust of Giuliano, Lorenzo’s younger brother, probably from the time of his entry into Florentine public life c. 1475 and attributed to Verrocchio, presents him as confident and arrogant, head held high and turned slightly to the side. 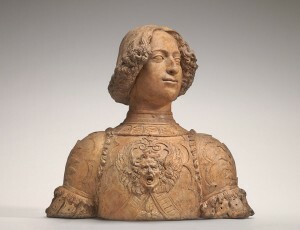 A fierce, grimacing mask, emblematic of inner ferocity, is positioned on his breast as part of the decoration of his armor, exemplifying the inner strength and resolve of this Medici prince. Lorenzo, continuing the tradition initiated by Piero after the death of Cosimo, commemorated himself and other members of the family on medals. 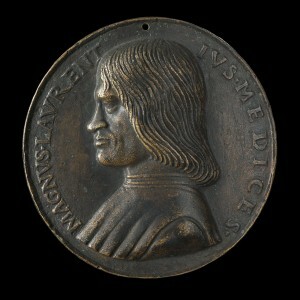 Toward the end of his life, a medal of Lorenzo was prepared and probably cast around 1489–90. It deliberately echoes in a number of ways the earlier medal of Cosimo, establishing the message of continuity that was stressed over and over again in the patronage of the Medici family. Shown in profile, wearing his hair in the longish Florentine bob of the second half of the fifteenth century, Lorenzo displays the determined expression that speaks of his responsibility both as the leading citizen of the city and as head of the Medici family, in charge of its fortunes and future success. formidable role of TVTELA PATRIE (Protection of the Country). On the reverse, a representation of Florentia, identified in the inscription along the bottom of the medal, leans against a laurel tree—laurel being one of Lorenzo’s personal emblems—and holds a lily, symbol of Florence. Taken as a whole, the message is strikingly similar to that of Cosimo’s medal: Florence, under Lorenzo as it was under Cosimo, is protected by the Medici. The medal was widely circulated and is also known in versions that omit the reverse. The fortunes of the Medici were almost crushed in 1478 when a coalition of Florentine families, aided and abetted by Pope Sixtus IV, staged an attack against the Medici brothers as they celebrated Sunday mass in the cathedral, S. Maria del Fiore. Giuliano, the younger and more handsome brother, was killed. Lorenzo escaped assassination by hiding in the sacristy of the cathedral. 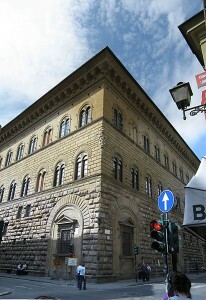 Spearheaded by the Pazzi family, rivals to the Medici in the international banking industry, the attack has come to be known as the Pazzi Conspiracy. An intriguing double-sided medal, designed by a favored Medici sculptor, Bertoldo di Giovanni, documented the attack, to publicize Lorenzo’s survival and commemorate the death of Giuliano. The octagonal architectural structure that dominates the medal is meant as a reference to the choir of S. Maria del Fiore. A lively group of figures, brandishing swords, is shown attacking on the Lorenzo side (obverse) and in the act of murder on the Giuliano side (reverse). Floating above the fray are the profile busts of Lorenzo and Giuliano. The double-sided medal sets Lorenzo’s quasi-miraculous escape from death—Lorenzo’s side of the medal is inscribed SALVS PVBLICA (public deliverance)—against the death of Giuliano, whose side is inscribed LVCTVS PVBLICA (public mourning). 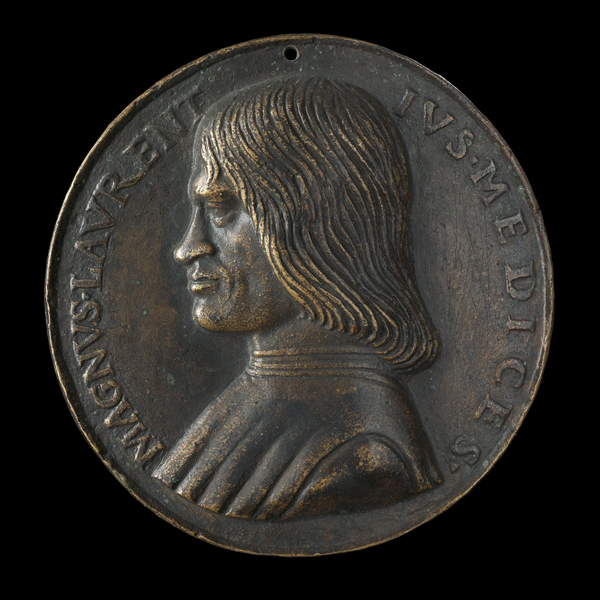 As the viewer turned the medal to view both sides, the clear message was one of Medici survival: one brother had died but the other remained to serve Florence. After Giuliano’s death, a touching portrait by Sandro Botticelli of c. 1480 created a poignant image of commemoration. The half-open window behind the bust-length portrait of Giuliano, a device taken from funerary art in antiquity, signifies entry into the world beyond. A turtledove, symbol of mourning, is perched on a dead branch placed on the windowsill, creating a transition between viewer and portrait. Giuliano’s eyes are lowered as if in farewell. The portrait preserves the confident, almost arrogant curl of the lips seen in the terracotta bust that was apparently one of Giuliano’s prominent features. Botticelli was among Lorenzo’s most favored painters. 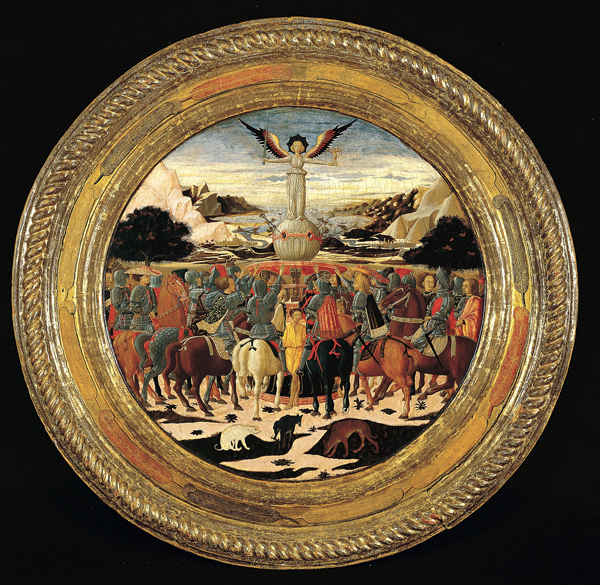 He produced numerous paintings with important Medici themes in the 1480s and early 1490s, either through the direct patronage of Lorenzo or for other members of the Medici family who were influenced by Lorenzo’s approach to collecting. In view of the flourishing art industry under Lorenzo, this period has been termed Florence’s Golden Age. The theme of the Adoration of the Magi, closely associated with the Medici earlier in the century, continued to be prominent under Lorenzo. 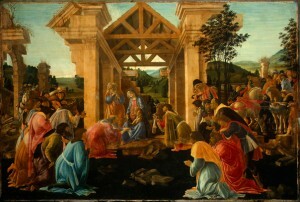 Among the examples produced during Lorenzo’s lifetime is a fine work by Botticelli of c. 1480. 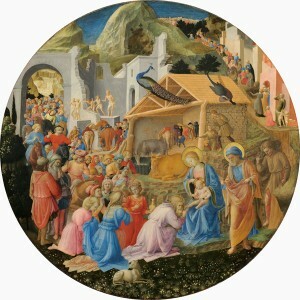 Unlike the earlier Adoration of the Magi tondo from the time of Cosimo, the elaborate procession has been simplified here, permitting a focus on the perspectival architecture, one of the specialties of Florentine workshops in the 1480s. The painting is known to have been in Rome in the sixteenth century; it may have been sent there from Florence to a Medici supporter or to strengthen family alliances. Another aspect of Lorenzo’s art policy was the sending of elegantly crafted works of art to foreign rulers as an indication of the high quality of Florentine artistic workshops and of Medici connoisseurship. Bronze reliefs of the ancient heroes Alexander the Great and Darius, king of Persia were sent to Matthias Corvinus, king of Hungary, in the hopes of furthering a political alliance. 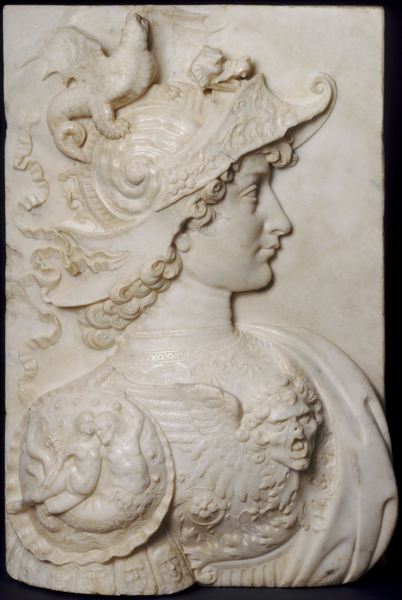 The reliefs are lost, but marble versions of profile warriors in antique dress may well be copies of the bronze originals; this example, attributed to Verrocchio, is one of the most impressive. In the sixteenth century Medici patronage expanded into a larger arena. In 1513 Giovanni de’ Medici, the son of Lorenzo, became Pope Leo X—the first of the Medici popes. The Medici were launched onto a grand stage. While Leo’s patronage belongs as much to the larger issue of the papacy and sixteenth-century Rome as it does to furthering the fortunes of the Medici family, there is ample indication that Pope Leo did not forget his obligation to ensure the family’s future success. 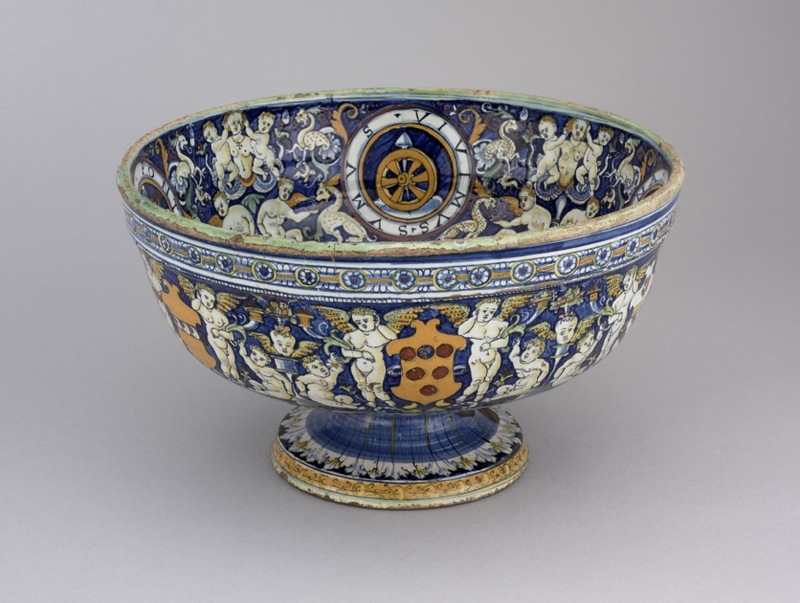 A large footed bowl of the type known as a rinfrescatoio, used for washing fruit or cooling wine flasks or glasses, presents Leo X in the context of a network of powerful Medici marriage alliances in both Florence and Rome. 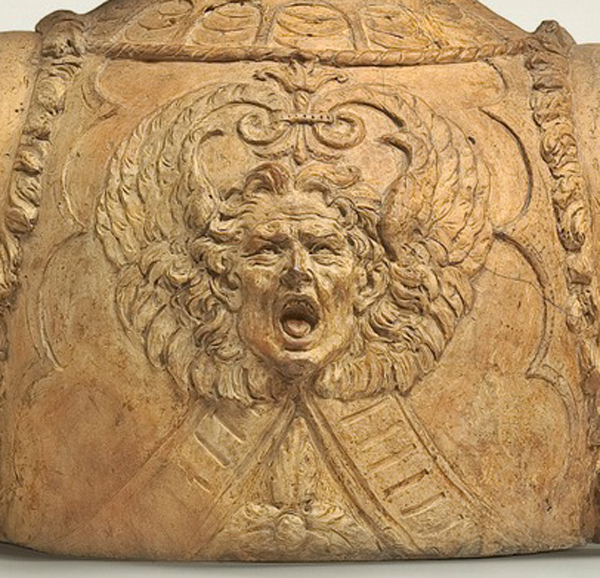 On the inside, in the center of the bowl, are Leo’s papal arms presented by celebratory putti. Along the inner rim of the bowl are four Medici devices: the diamond ring with the three colored ostrich feathers and the motto SENPER [sic: SEMPER] (Always); the yoke with the motto SVAVE (Gentle); a wheel held fast with a nail, an image of fixed power; and an eagle with the motto RENOVABITVR, “Renewal.” These are devices used by earlier members of the Medici family, with the exception of the wheel and nail. This last appears to be an invention by Leo himself to refer to the renewal of Medici fortunes, signified by his own elevation to the papacy and the Medici return to power in Florence in 1512 after a period of exile. 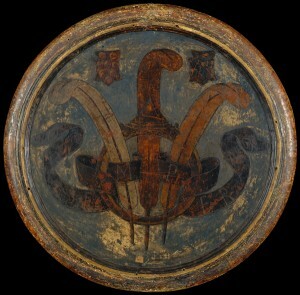 On the outside of the bowl, Medici arms alternate with the arms of families with whom the Medici had formed important alliances—the Orsini of Rome and the Strozzi and Salviati of Florence. 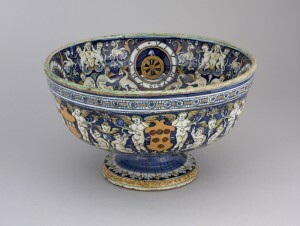 This carefully crafted and impressive bowl, very likely on prominent display in one of the Medici residences, was probably produced to celebrate one particular alliance—the marriage in 1516 of Maria Salviati, a descendant of one branch of the Medici family, to Giovanni dalle Bande Nere, the descendant of another. It was this marriage that was seen as holding the promise of bringing new blood into the Medici lineage. The hope was not in vain. The first-born son of the couple, in 1537, was Cosimo I de’ Medici, who would become the princely ruler of Florence. Medici self-promotion reached a culmination in the patronage of Cosimo I, the first member of the Medici family to bear the title of duke. With his ascendancy to the rule of Florence in 1537, the position of the Medici as the supreme rulers of Florence would be assured for several centuries. Cosimo I’s patronage was vast and complex. 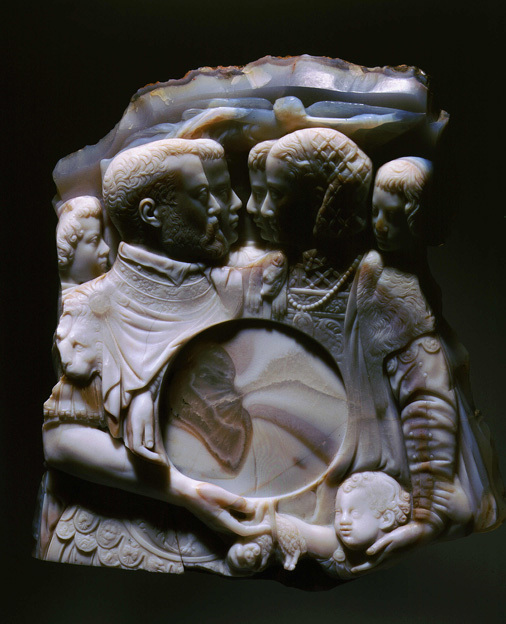 A single example that encapsulates the refinement of taste of the Cosimo court is a grand cameo depicting the duke with members of his family. Cosimo and his wife, Eleonora of Toledo, are shown in the foreground, together with their five sons. An allegorical figure of Fame flies overhead, blowing a trumpet. The couple wraps their arms around a recessed disk, perhaps meant to be filled by a celebratory medal. This exquisite work of art is a direct reference to the grand cameos of imperial Rome, many of which were eagerly collected by the Medici.